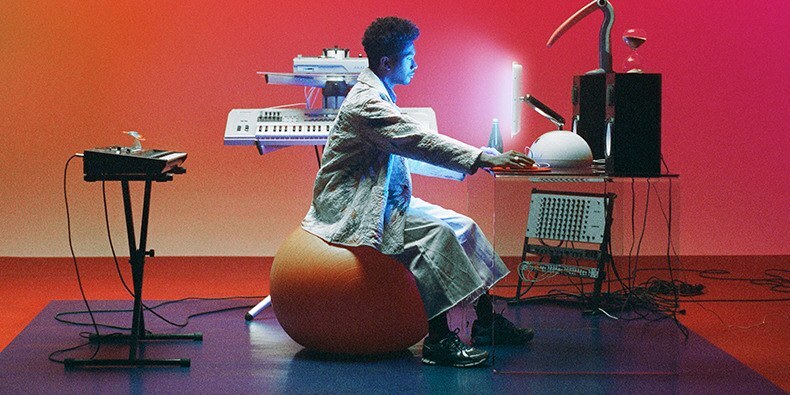 The fabulous catchy, eccentric disco funk of single Freelance, which we profiled on Song of the Day, bears out in the rest of this album by the American singer, songwriter, record producer and graphic designer in what amounts already to his seventh studio release. Listen out also for funky African drums and that high, souful breathy voice on Ordinary Pleasure, for example. Out on Carpark. First album by the Scottish indie band since first since the apparently amicable departure of one of their founding members, drummer Mark Devine in early last year. Since their last album, the band seem to a re-found power and emotion with their first release on Rock Action, a label they now share with Mogwai. There's a prominent 80s synth element to this new release, but even stronger outpouring of feeling about the loss of best friend Scott Hutchison, particularly in the the delivery of singer James Graham. Cathartic and powerful work. Out on Rock Action Records. Staying with Scottish artists, the fourth solo release from the former Beta Band frontman, who seems now to have found better mental health and happiness, is perhaps reflected in this work of consistently great, offbeat, indie pop. There's even a rockier sound, the album seems written less in solitude, more with his band. There's still that fun obsession with space, as shown on the single, Stars Around My Heart, and on other tracks such as The End, About The Light, and Walking Away From Love, there's also, for long-term fans, very pleasing elements of that classic Beta Band sound. Perhaps is strongest solo effort yet. Out on Double Six / Domino. Death, grief, serenity, acceptance, they are all here in American singer-songwriter's latest LP of nine sensitive songs, his first since 2016, which has unusual for a man who has released at least one a year since 2007, as well a being guitarist with Kurt Vile, yet clearly, with the death of his father, and much else since, there has been much to ponder. Stonehurst Cowboy is a lovely tribute song to him, but there are also many magical moments of wonderful warm vocals images on the Nick Drake-ish the reflective, light-spattered New Moon, and the upbeat steel pedal guitar on Vagabond. Out on Matador. The American alt-rocker returns with her 17th solo album and 25th overall, including variously with Blake Babes, The Lemonheads and Some Girls. This is tasty, solid goodness in that Sleater-Kinney style of songwriting - crunchy guitar, self-effacing down-to-earth and catchy. Her voice still sounds as young and fresh as ever on an album full of upbeat tracks to the slower, fuzzier single, Lost Ship. Out on American Laundromat. The fourth single, as below, takes inspiration for its title from Pre-Millennium Tension, the 1996 LP from Tricky, an acknowledged primary influence on the couple Ebony Hoorn and Mancunian partner Ellery James Roberts, now living in Amsterdam. The whole album is a sign of the times protest of disenchantment, and musically echoes something of dystopian epic, profound, often angry delivery and orchestration of The The's Matt Johnson. But this certainly confident, dynamic work, if a little overdone at times, with affectation in inflection in those vocals, proclaiming lines such as: "This world we know is a volcano about to blow. The first crash should have been a been a warning to a new dark age that was dawning." This is no sugarcoated pop, nor the sort of record you meet expect on quirky Mute Records, but there’s a strong warning here that Lost Under Heaven are worth keeping an ear out for. Or we’re all doomed. Out on Mute. Groovy dance instrumental from the Copenhagen DJ and producer, pulling you gently into trippy, deep house. Relaxing, energising and recuperative. Out on Music For Dreams.